These Coquina and Foraminafera type organisms need Light to grow. Hence their abundance in shallow waterS. * Do you know of anywhere on Earth where shallow waters are forming limestone from foraminafera, or shells etc? * There's lots of krill toward the surface of the deep oceans. There's plankton etc too. The krill definitely have shells. And krill is the most or one of the most abundant species on Earth. Why don't dead krill shells end up on the ocean floors, making a layer of limestone? * All those hundreds or thousands of feet thickness of limestone on the continents are supposed to have formed in shallow water, 70 feet or less. So when the 70 foot thick layer is made and the shallow sea is filled in, how does the sea level then rise just enough to allow another 70 foot layer to form? * And where does the new calcium and carbon keep coming from to keep making new layers of limestone? Different generative ages manifest different life forms. 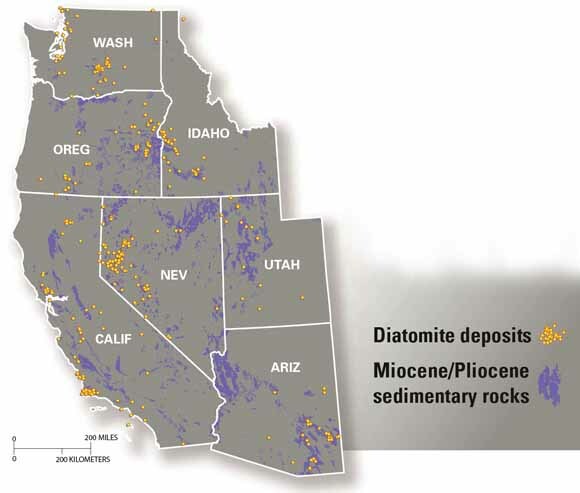 I've spent some time collecting and studying diatomaceous earth from eastern Washington...similar formation mechanism to chalk, and by extension, to limestone. The stuff is mined by a group out of Oregon, for sale to swimming pool filter folks, and used in toothpaste, dynamite, etc. These diatomite beds are sandwiched [I like to say "lensed"] cleanly between beds of basalt which can be found elsewhere to lie "conformably" atop each other. That tells me that the mechanisms for their formation may have to do with incursion of flooding diatom-rich seawater [perhaps tsunamis?] over a "hot" layer of recently poured lava, being boiled away rapidly [rather than slow detritus-like accumulation on a seafloor] then overlaid by another successive flow... quite contrary to the usual scenario of the layers of lava taking millions of years to accumulate. Within the diatomite beds, which are generally very powdery in texture, and in which microscopic fragments and intact portions of diatom shells can be discovered, there are solid "lenses" of diatomaceous opal, surrounded by the powdery diatomacous earth. Cross-sectionally the rocks show "expanding" layers of crystalization from the center outward. This evidence suggests to me the additional scenario of heat from both above and below the diatomite driving water toward the middle of the formation, this superhot material then dissolving the silica shells and recrystalizing as the diatomaceous opal. The "shallow seas" paradigm plays no part in this mechanism. * Web, that's an interesting analysis of diatomite beds and opal etc. I have some questions for you below. 1. It was noted that the deposited material organised itself immediately after deposition into periodic graded laminae giving the appearance of successive beds. 2. One of the more striking features of these laminae formed in the sediment itself was their regular periodicity. 3. The thickness of the laminae was measured in millimetres. It was independent of the speed of sedimentation and varied according to the extreme difference in the size of the mixed particles. 4. When deposition took place in a water flow, the lamination phenomenon was also observed. The geometry of lamination was modified by the water flow, but the latter was not the cause of the modification. 5. The periodic graded laminae were similar to the laminae or varves observed in nature which are interpreted as a superposition of seasonal or annual beds. Their origin, however, was quite different, arising from periodic structuring after deposition. 6. The question now is to study a number of laminated or varved formations in relation to this mechanism, particularly looking for physical structuring obtained from experimentation. * Sounds to me like the laminae or thin layers have nothing to do with seasonal deposition, but are a result of natural sorting during deposition. diatomite beds are sandwiched ["lensed"] cleanly between beds of basalt which can be found elsewhere to lie "conformably" atop each other. When the diatoms die, their skeletal remains sink to the lake bottom and create a thin layer. After many blooms over many hundreds of years, these thin layers can accumulate to form diatomite deposits meters thick (fig. 5)! * Is that plausible to you? If you look on the bottoms of lakes, can you find a rock stratum of diatomite at the bottom covered with a thin layer of dead diatoms? there was repetition of such layering. electrically heated. A metamorphic rock ? The diatomite is found exposed at the surface of course, as shown in your mapping, but in relation to layers of basalt that are seen elsewhere to lie together conformably. Some of these basalts are pillow formations, indicating deposition under [or into] a body of water, another widespread indicator that the water flooding was contemporary with the basalt flooding. 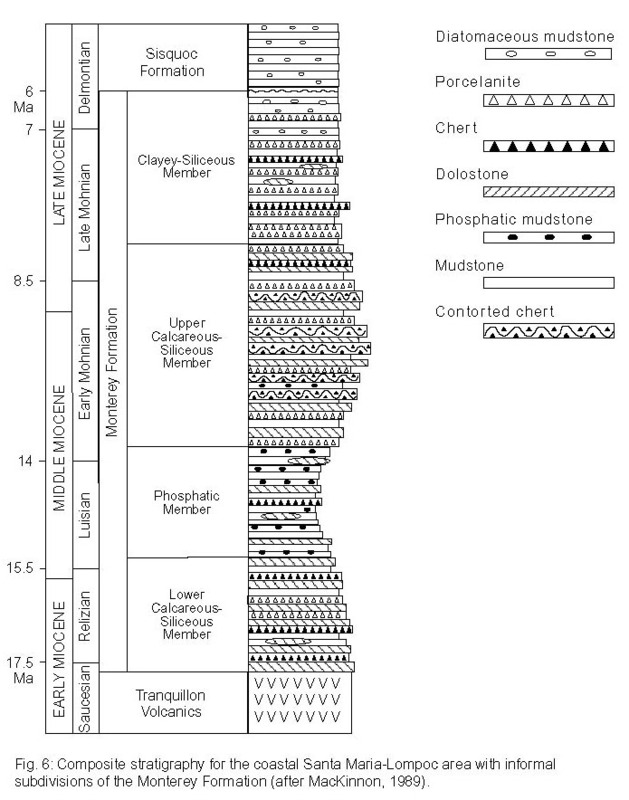 The composite stratigraphy in the Texas link, like all composited geologic columns, is built on the assumption that different sedimentary compositions are derived from different eras of time, therefore putting them together requires making assumptions about the geologic time [or lack thereof] involved. The assumptions about time drive the conclusions about superposition, resulting in the hypothetical column. For example, it is quite possible that layers from the "Early Miocene" were actually coeval with layers from the "Late Miocene" etc. In the field, it is different... you see a deposit between two other layers in one place, and those two layers sitting conformably atop one another elsewhere, and you ask the question, how did this happen? Bottom line, the story you tell depends on the timescale you believe. I'm unsure from the lack of description of the diatomaceous mudstone if this is the same type of deposit I see in Washington. There is nothing particularly "muddy" about our local stuff. This would not significantly affect the mechanism I suggested, but the layering depicted in the hypothetical column, if it appears thus in the field, might reflect one of the particle sorting mechanisms you mentioned. The Cambrian sediment contain creatures that still exist today. event of Mars coming very close to Earth in the Saturn System. off during a subsequent Mars approach. Therefore we will find the missing links to evolution on Mars !! that time. Because the first fossils are very complex. System would have produced much electrical interaction. so severe an electrical interaction with Earth. Perhaps some event reduced the electrical potential. and Earth can prosper in perhaps a golden age. leading to today's stable arrangement. * I don't think the theory that the ancient polar plasma column brought life from Mars to Earth is well thought out yet. I think Cardona and or Talbott think the column sucked up much of Earth's early water supply and held it for centuries or millennia and then released it during the Saturn System breakup. I think it's highly unlikely that most life forms could be sustained in the column and move safely from planet to planet. the column and move safely from planet to planet. that would be hazardous to life. The problem is the pressure. pinch. Thus an atmosphere is possible inside the pinch. to survive the inundation of the muddy sediment. the Saturn System Dave Talbott came up with Mar's crust undergoing EDM. All the "links" are missing. Hence all those dotted lines in phylogenetic tree diagrams. If they aren't dotted, the artist is dishonest. higher Li/Al ratio in the Mesozoic sediment. So a little evidence. The Martian rocks would be deep crust or mantle rocks. "Many trilobites had complex eyes; they also had a pair of antennae." Earth and maybe Saturn, and a very electric Saturn System was formed. Precambrian rocks and the Earth Cambrian rocks formed. So the theory is going OK ! Mo, I don't think your theory will appeal to anyone as long as you can't show somehow that plasma columns, tornadoes etc are capable of transporting living things through space without killing them. Also, there needs to be evidence of life having existed on Mars. The so-called fossil microbes found in Mars rocks from Antarctica are said to be effects of preparing the rock for electron microscope viewing. So there's no solid evidence yet for former life there. You'll just have to wait till a Mars mission retrieves such fossils.